By Jason Davis – WASHINGTON, DC (Mar 20, 2019) US Soccer Players - The USMNT is coming out of a dark period. The failure to qualify for the 2018 World Cup casts a shadow over the program that still lingers, more than a year-and-a-half after the loss in Trinidad eliminated the Americans from the tournament in Russia. The memories of how it all went wrong haven’t faded. Questions about roster selection, tactics, and lineups in crucial World Cup qualifiers back in 2017 remain present in the minds of fans across the country. While a number of figures got part of the blame for the results of the Hex, the choices of the head coaches are of particular focus. One of the hallmarks of Jurgen Klinsmann’s tenure as USMNT coach was his propensity for moving players out of their usual positions into other areas of the lineup. A list of Klinsmann’s tinkering would be long and lacking context, but it’s enough to say that he liked to challenge players by forcing them to adapt to new responsibilities. In some cases, Klinsmann likely thought that playing a player “out of position” was the best solution to a pressing problem and gave his team the best chance to win. We have results by which to judge Klinsmann. We don’t yet have that with Gregg Berhalter, the man tasked with reviving the USMNT program in 2019. Thursday’s friendly against Ecuador in Orlando will be the first time Berhalter will coach the US at full strength. Minus a few players unavailable because of injuries, Berhalter had his choice from the entirety of the American player pool. What happened over the last cycle is probably why Berhalter isn’t getting much benefit of the doubt when it comes to his positional choices. It’s important to note that while Klinsmann often moved players out of their “natural” positions, he never gave advance notice of those moves or fully explained the reasoning behind them after the fact. Klinsmann’s choices were mysterious ones, with the information gap playing a large role in how fans and analysts viewed them. When they didn’t work, there was no way to better understand them within the structure of the team. Only Klinsmann and his staff really knew what they were trying to accomplish. Berhalter is taking a different approach. That we even have a “surprising” positional wrinkle to talk about ahead of two March friendlies speaks to the new coach’s propensity for careful explanation and transparency. 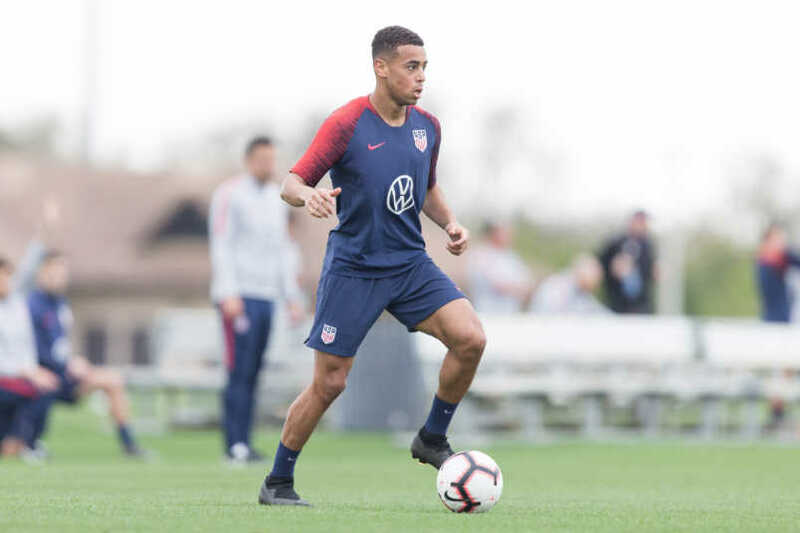 News broke from Orlando on Monday that Berhalter intends to play Tyler Adams as a right back. Adams is a central midfielder for RB Leipzig of the Bundesliga, where he is thriving since joining the club. There are a couple of caveats, one of them large, to the “Tyler Adams as a right back” statement. First, the small one. Adams may not be playing as a right back now, but he has played the position in the past for the New York Red Bulls. On his way up from the academy system in New Jersey, Adams played in the back line before he seized control of a holding midfield spot. In retrospect, it’s easy to believe that Adams was always destined for a move to midfield. Still, there was a time not so long ago with the Red Bulls when right back looked like it could be his best position. The second caveat, the large one, comes from Berhalter’s system. The coach outlined not just the plan to play Adams as a right back and DeAndre Yedlin in midfield, but the reasons why it makes sense. As evidenced by the January camp and the system deployed by the United States, the right back is more of a roaming defender/midfielder than the traditional role. Even the usual modern description of a right back, as wing attacker in addition to the defensive responsibilities, fails to capture the utility of the position in Berhalter’s plan. Nick Lima’s showing in January proved effective enough for Berhalter that he now wants to try the ultra-mobile Adams in the role. Despite the caveats and despite thousands of words spilled to explain the full context of Berhalter’s plan for Adams, the reaction has been one of bewilderment. Playing Adams in a position other than the one in which he’s starring for Leipzig seems strange at best and potentially damaging to the player and the USMNT at worst. None of the reaction is fair to either Adams or Berhalter. The new coach especially deserves time to put his imprint on a team following the interim year of 2018. Interim coach Dave Sarachan did his job, most notably bringing through young players like Adams. However, nobody expects a caretaker coach to formulate a tactical identity. Berhalter won’t coach a meaningful match for the United States until the Gold Cup arrives in June. The two friendlies during this FIFA international window will be challenging, but they’re still friendlies. No matter how much intensity the Americans bring to the table, neither match will approximate a game with something on the line. If the Adams plan fails against Ecuador and Chile, some will take it as evidence that Berhalter was wrong and that Adams should play his club role. If the experiment works and Adams excels as a roaming right back, the friendly nature of the game will undercut the evidence at hand. As is usually the case, these friendlies are more lose/lose than win/win. That doesn’t mean they aren’t valuable to Berhalter and his staff, just that they the weight they carry as the team builds towards the summer is impossible to pin down. The difficult reality for impatient fans ready to see the team take gigantic steps forward is that the wait continues. It's going to take the Gold Cup to get a firm idea of the early returns from the Berhalter era. It's not just winning this summer, it's how the USMNT plays. At the beginning of any other World Cup cycle, a head coach would get the chance to bed in his ideas before the knives came out. This isn't the situation with the USMNT. Berhalter knew what he was taking on. So far, he seems unphased by questions about his system and is willing to explain them. Tyler Adams at right back is just one example of Berhalter doing something that seems unconventional on the surface but has a clear purpose. Maybe it will work, maybe it won’t. Either way, the new head coach deserves a chance to try.